There are no details as yet on what the government plans but it will be relatively low-key on a day considered unlucky for some. "I was thinking we could have a big party?" THE GOVERNMENT INTENDS to mark the exit from Ireland’s EU/IMF bailout on Friday the 13th, two days before the programme formally ends in less than a fortnight’s time. While no details of what events are planned have been confirmed as yet it is likely that a press briefing will take place on that day, and that anything that does happen outside of that will be relatively low-key. Friday the 13th has long been considered the unluckiest day of the calendar with a series of American horror movies part of the ‘Friday the 13th’ franchise while rapper Tupac Shakur also died on Friday the 13th. But for the government that’s just the way it is as they hope things will never be the same as they have been over the past three years of the EU/IMF programme. Paraskevidekatriaphobia is described as an irrational fear of Friday, the 13th. It’s derived from the Greek words ‘Paraskeví’ and ‘dekatreís’, meaning ‘Friday’ and ‘thirteen’ respectively. Charles Stewart Parnell, nationalist leader and founder of the Irish Parliamentary Party, is also said to have had a fear of the number 13. Few hotels have a 13th floor while some airlines do not have a 13th row on their planes. But nonetheless it appears the government is pressing ahead with plans to mark the bailout exit on that date with the programme formally ending on the following Sunday. 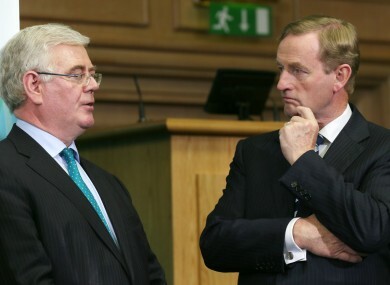 There is unlikely to be any address to the nation by Enda Kenny, which had been speculated about. The Taoiseach has previously addressed the nation prior to the coalition delivering its first Budget in 2011. Email “Government plans to mark bailout exit on Friday the 13th ”. Feedback on “Government plans to mark bailout exit on Friday the 13th ”.